You are currently browsing the archives for the tag 'SMOOTHING BODY CREAM'. Clarins Eau des Jardins is a wellness scent of orange zest, grapefruit and wild rose petals that invigorates the senses by combining fragrance and treatment benefits of plant extracts so you smell and feel good, too! The products are meant to help you focus and get on track, what a great way to start your day. To complement the line, Clarins has launched two new body products scented with the same blend, a body wash and a body cream. What a delicious way to cleanse your skin! The uplifting fragrance of Eau des Jardins blends with the gentleness of a rich, foaming lather that gives you an instant well-being. It is soap-free and ph-balanced which means suitable for all skin types. Showering becomes a source of beauty. The cream has an interesting formula, irresistibly smooth to the touch – it seems to be watery and absorbs almost instantly into the skin. You are totally moisturized in a snap. 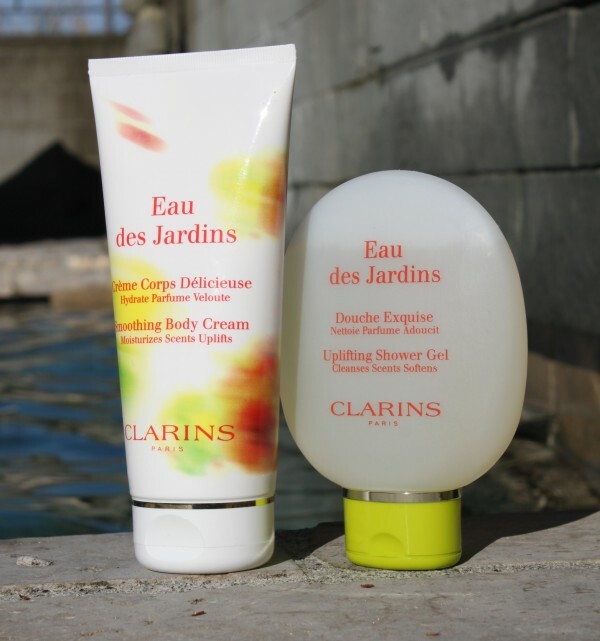 The smell of Clarins Eau des Jardins is so beautiful and uplifting that you could totally use those body products in combination with your very own perfume. Available at all Clarins counters.